Engineers at the Goddard Space Flight Center in Maryland have hit a snag in their efforts to bring the Hubble Space Telescope back on-line after a major equipment failure in space last month. 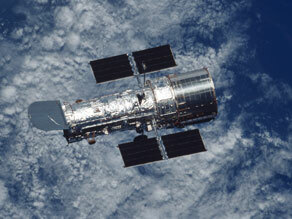 Hubble's Science Instrument Control and Data Handling (SIC&DH) system went down September 27. This is the telescope's on-board computer that coordinates commands to the various instruments and then downlinks the scientific data to the ground. While that computer is off-line, most science observations are at a standstill. The good news is that the computer was built with a fully redundant back-up channel called "Side B" designed to come on-line in the event "Side A" ever failed. Hubble team members at Goddard began a complicated process to switch over to "Side B" on Wednesday. This involved sending comprehensive software commands up to the telescope to essentially take control of Hubble's suite of telescopes and other sensors through "Side B," recalibrate all those instruments which went into safe-mode when the computer went down, start and stop gyroscopes, downlink data, and then check the data quality against some older "Side A" samples to make sure all is square. Problems cropped up somewhere in that process Thursday night. We haven't been told yet exactly what happened. The team is meeting today to discuss a further troubleshooting plan. We may get additional details later when that meeting ends. I am told they don't expect the issue to be resolved today. As noted, the switch-over process is extremely complicated, and it is probably to be expected that they would hit some sort of snag. Hopefully, they will work through it in the coming days and science operations can resume soon. Even if the switch-over to "Side B" fails (and it is far too soon to go there), the Hubble design team had the foresight 20 years ago to build a spare SIC&DH system, which has been warehoused at Goddard all this time while the original instrument perked along just fine. Astronauts are scheduled to conduct a fifth and and final Hubble servicing mission in the February time frame, and will almost certainly remove and replace the malfunctioning computer with the spare. That mission was supposed to fly this month, but was postponed when the failure occurred to give the ground teams time to check out the spare and astronauts time to train on the removal and replacement procedure (which is apparently a relatively straightforward, two-hour spacewalk task). If there is any silver lining to this whole thing, it's that the failure happened before the servicing mission - while there is still the opportunity to fix it. Imagine the disappointment if it had happened right after the astronauts returned! I'll update later today if and when I get more information. 7PM UPDATE: NASA just held a teleconference for reporters to discuss the Hubble mission delay. The basic facts we gave you earlier in the day still hold up. The part that has failed is called the Control Unit/Science Data Formatter. There is a replacement part housed at the Goddard Space Flight Center, where Hubble operations are based. The Hubble team will be putting that part through a series of tests to make sure it is operational and ready to fly, and they say they are confident it will pass. If all goes as planned, Atlantis could be ready to fly by mid-February. In the mean time, the Space Shuttle Program will be making forward plans over the next couple of weeks. Most likely, they will decide to remove the Hubble payload from Atlantis and eventually roll that shuttle back to the Vehicle Assembly Building. Endeavour would then move to launch pad 39A and could be ready to launch as soon as November 14. 4PM UPDATE: NASA has confirmed the launch will be delayed. A new launch date has not been announced, but it will likely slip to January or February 2009. Regarding the malfunctioning computer on the telescope: for an unknown reason, the principal channel on the on-board scientific data download system stopped working over the weekend. Efforts to troubleshoot the problem have failed. Later this week, telescope operators will try to activate a redundant downlink channel. That "B-side" channel has never been switched on in orbit - it was last activated during ground tests in the late 1980's or early 1990. Even it it works, the computer system will be left without redundancy. Scientists and engineers will need time to study the problem, and determine whether that system can be replaced during the upcoming mission. It would also take time for engineers to configure replacement hardware for flight, and for astronauts to train for a removal and replacement task. Sources tell CNN the space shuttle Atlantis mission to conduct the fifth and final servicing mission for the Hubble Space Telescope will very likely be delayed until early next year. An additional technical problem has cropped up with the telescope's on-board scientific data downlink computer. Scientists and engineers will need time to study the problem, and determine whether additional repair tasks will be added to the mission. Atlantis has been targeted for launch October 14. The next shuttle mission in the queue is a shuttle Endeavour mission to the International Space Station. It is currently targeted for launch on November 16.